Beijing, PRC – Liberia and China have pledged to strengthen ties between the two countries. Both countries made the pledge when President George Manneh Weah met the President Xi Jinping, during bilateral discussions ahead of the 2018 Beijing Summit of the Forum on China -Africa Cooperation at the Great Hall of the People on Saturday, September 1, 2018. The Liberian leader reiterated his country’s firm adherence to the one-China policy and expressed heartfelt gratitude for China’s valuable support, especially the selfless help in Liberia’s fight against the Ebola epidemic. President Weah noted that the mutually beneficial cooperation between both countries has brought perceptible benefits to the Liberian people. “Liberia supports and is willing to take part in the Belt and Road cooperation,” he stressed. He indicated that Liberia supports China hosting the Beijing Summit of the FOCAC, and is willing to make whatever contributions to enhance friendship between the two countries and peoples. Earlier, welcoming the Liberian leader to the People’s Republic of China, President Xi stressed that the friendship between China and Liberia continues to serve the fundamental interests of both countries and people. He reflected on his country’s support to Liberia’s peace process and promised to continue to stand up and support Liberia in multilateral institutions. President Xi highlighted the Liberian Government’s firm position on the one-China policy and is willing to increase exchanges at all levels; emphasizing that the two countries should continue to show mutual understanding and support each other on issues involving their respective core interests and major concerns. The Chinese President promised to strengthen bilateral cooperation on various fields especially those outlined in the Liberian Government’s national development agenda focused on infrastructure development, poverty reduction, health, agriculture, and education, among others. 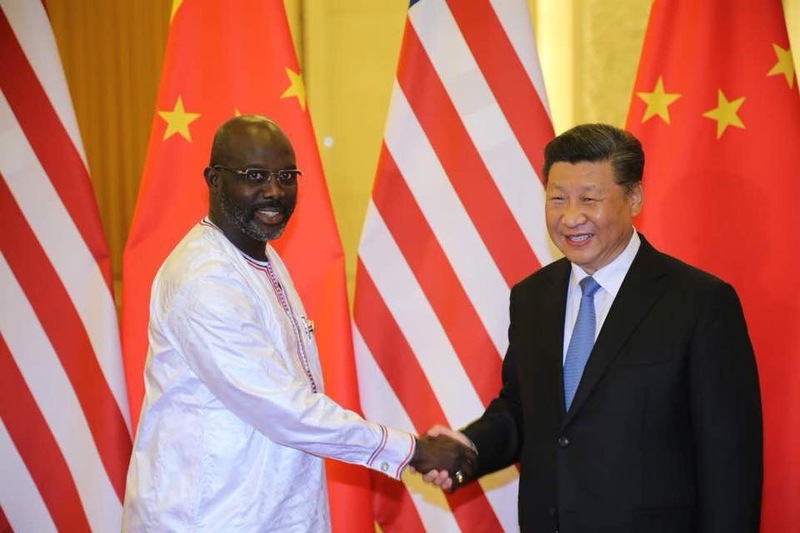 President Xi hoped that as a former world football star, deeply admired by his compatriots, President Weah will use his special influence to promote sports and youth exchanges between the two countries. Meanwhile, after the meeting, the two leaders witnessed the signing of two cooperation agreements totaling US$54 million (320 million RMB). The first is the construction of two overpasses at SKD Boulevard and the Ministerial Complex; while the other is the provision of emergency food aid.